The town is buzzing and the news is all about people lining up in advance of Thursday big full day of activities and the first full day in Hall H. Fortunately for us we were not planning on going to Hall H. Our plan was to go to Ballroom 20. This room holds 2000 people or something like that while Hall H holds 6000. That sounds like a lot of people but when you consider that there are 100,000 people attending Comic-Con the Odds are Not in your Favor. So there are lines. Somehow, we hit a pocket. We timed it perfectly. Beginners luck I suppose. Today our mission was to get into the Teen Wolf panel in Ballroom 20. When we arrived at the convention center there was no line. We just walked right in - later on we had heard that people who were standing near us in line for Ballroom 20 had been in line outside since 10pm the night before. SO, not exactly sure how we did it but that is how I hope to be able to do this every year. Waiting in line at Comic-Con is really not a bad thing. People are friendly and they are all enthusiastic about the event you are about to attend. So, conversations with people you have never met before are not only easy but also very engaging. Waiting in line is no guarantee that you will get into an event but it seems like the organizers are working at making the system better so that you are not waiting in line if it is completely futile. There is one thing for sure. No single person can do it all at Comic-Con. The Thursday line-up was so jam packed with awesome panels all over the convention center that we had to make some tough choices. 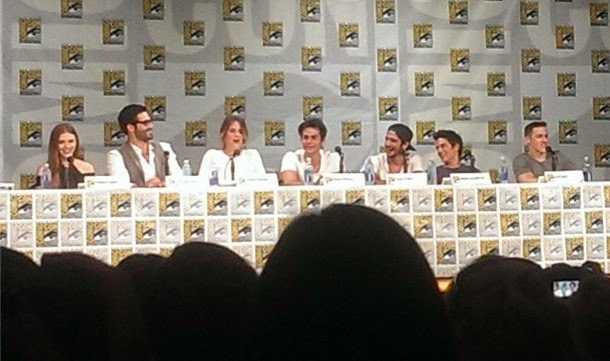 Our choice was much easier because the MTV Teen Wolf panel was really THE one panel that we really wanted to see. So we worked our schedule around how to ensure that we get in to that one. We did get into the Teen Wolf panel and it was as much fun as we had hoped. The lineup included several of the the stars from the show along with the creator and a moderator. One of the great things about the Teen Wolf team is that they really know how to engage the audience sitting there. Tyler Posey, the Teen Wolf, entered the stage doing cartwheels. When he sat down he laughed about his ridiculously bad cartwheels and said "I think I broke my toe". Later on in the day he tweeted out "Remember when I said I think I broke my toe. Well I did actually break my toe". But it didn't slow him down at all. During the panels the celebrities sit behind a long table and answer questions. Several of the panels we saw today were awesome but the celebrities just sat there answering questions and as long as you got one good picture you were set because there was really nothing else happening as far as a single picture goes. 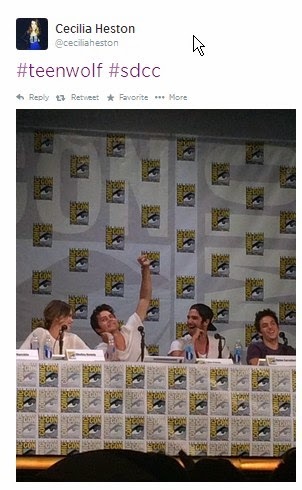 But the Teen Wolf panel was different. Tyler Posey would enthusiastically point out to the crowd and raise up his arms and was basically very animated which made for more fun pictures of the panel. And they all were cracking each other up so much that the pictures of them laughing and having fun were great. Tyler Hoechlin was just as charming as you could want a wolfy to be and, really like all of the panel, was great about interacting with the audience. The room was filled with Teen Wolf fans. They had waited all day to spend just under an hour with these celebs and they were all hoping for an experience that would be just a little bit something more than watching an interview on TV. They wanted to feel that connection with these actors. The Teen Wolf panel delivered. They gave everyone in the room a feeling of acknowledgement that the fans are important and that being a fan of the show is awesome. Everything else from here on out is just a bonus for us at Comic-Con. That was our goal. To get to #SDCC2014 and see the Teen Wolf panel. Not sure what the rest of the weekend will bring but I'm sure it will continue to be awesome.